The rapid emergence of resistance in Plasmodium falciparum to nearly all currently used anti-malarials makes control of falciparum malaria a difficult task. Identification of new drug targets for development of new anti-malarials is urgently needed. The malaria parasite lacks thymidine salvage pathway and depends solely on de novo pyrimidine synthesis[1, 2], in contrast to the human host, which utilizes both de novo and salvage pathways. Serine hydroxymethyltransferase (SHMT) is one of three enzymes involved in dTMP cycle, namely, dihydrofolate reductase (DHFR) and thymidylate synthase (TS). SHMT has a pyridoxal phosphate as a cofactor and participates in one-carbon metabolism, in which SHMT converts serine and tetrahydrofolate (THF) to glycine and methylenetetrahydrofolate (MTHF) respectively. SHMT has been investigated as a possible drug target in cancer and microbial therapeutics, particularly as SHMT expression is tightly regulated with DNA replication during cell division and the enzyme catalyzes the rate-limiting step in dTMP synthesis cycle[3–9]. Two forms of SHMT, cytosolic (c) and mitochondrial (m), can be found in eukaryotes[10, 11]. Based on DNA sequence search in PlasmoDB, there are two genes encoding SHMT in Plasmodium spp. : Plasmodium falciparum contains PFL1720w (PF3D7_1235600), a previously characterized cSHMT gene (Pfcshmt), and PF14_0534 (PF3D7_1456100), a putative gene of mSHMT (Pfmshmt). While the enzymatic function of recombinant Pf cSHMT has been shown, the heterologously expressed Pf mSHMT was found to be inactive[9, 12, 13]. Pf mSHMT has been proposed to function in association with glycine cleavage components, but experimental proof has yet to be provided. As for the cytosolic isoform, alignment of amino acid sequences of Plasmodium cSHMT with human cSHMT shows an overall 44% homology and 80% similarity at the active site. In contrast to mammalian SHMTs, Plasmodium SHMTs can convert D-serine, in addition to its physiological substrate L-serine, to glycine in the folate-dependent reaction[9, 15]. Comparison between the crystal structure of human cSHMT and homology model of Pf cSHMT has revealed differences at the substrate binding site, which could be exploited for the development of specific anti-malarial inhibitors that do not cross inhibit the human enzymes. Despite several lines of indirect evidence for the essential role of SHMT in malaria parasite growth, there is hitherto a lack of direct demonstration of this notion. Here, the study provides the genetic evidence confirming the two distinct compartmental localization of SHMT isoforms and demonstrates the indispensable role of cSHMT in growth and development of Plasmodium parasites. All chemicals used were of the highest quality commercially available. The sequences of primers are listed in Additional file1. Semi-quantitative reverse transcription PCR (semi-quantitative RT-PCR) was employed to measure expression levels of Pfcshmt (primers Bgl II 5′Pfcshmt and Eco RV 3′Pfcshmt) and putative Pfmshmt (primers Bgl II 5′Pfmshmt and Kpn I 3′Pfmshmt) relative to that of house-keeping gene Pfα-tubulin-2 (primers Pfα-tubulin-2 F and Pfα-tubulin-2 R). Total RNA was extracted from sorbitol-synchronized P. falciparum 3D7 strain at ring, early trophozoite, late trophozoite, and schizont stages using TRIzol® reagent (Invitrogen™, California, USA). Contaminating DNA was removed with RNase-free DNase I (New England Biolabs, Massachusetts, USA). cDNA was synthesized using oligo-dT primer and M-MuLV reverse transcriptase (New England Biolabs). PCR amplification was conducted using GoTaq® DNA polymerase (Promega, Wisconsin, USA) and the following thermal cycling conditions: 95°C for 3 minutes; 20 or 25 cycles of 95°C for 30 seconds, 50°C for 30 seconds, and 72°C for 2 minutes; and a final heating step of 72°C for 5 minutes. Amplicons were resolved by 2% agarose gel-electrophoresis, stained with ethidium bromide, and analysed for their intensities with ImageQuant™ Software (Molecular Dynamics, California, USA). Plasmids for the study of gene knockout in Plasmodium berghei ANKA strain were constructed based on the sequence of pL0017 vector (The Malaria Research and Reference Reagent Resource Center; MR4), which contains Toxoplasma gondii dihydrofolate reductase-thymidylate synthase (Tgdhfr/ts) and green fluorescent protein gene (gfp) expression cassettes for pyrimethamine (PYR) selection and fluorescence detection of transfected parasites. The 553 and 1,018 bp of PCR amplicons, corresponding to 5′- and 3′UTR of Pbcshmt (PBANKA_145020) respectively, were produced initially from P. berghei genomic DNA (gDNA). The 5′UTR fragment was inserted into pL0017 at Hind III site, while the 3′UTR fragment was inserted at Kpn I and Sac II sites respectively. This construct, pL0017_Δshmt, was used in the knockout study. For allelic replacement construct, gfp in pL0017_Δshmt was replaced with Plasmodium vivax cshmt (Pvcshmt; PVX_100730) and named pL0017_(Pv)Δshmt. Vectors for localization study were modified from the original pSSPF2/Pf Hsp60-GFP vector (a gift from Shigeharu Sato, MRC National Institute for Medical Research, UK). Initially, a short linker encoding 14 amino acids (SASKLGTSRATNNT) was inserted at Avr II restriction site using two complementary oligonucleotides (Linker F and Linker R), which resulted in pSSPF2/Pf Hsp60-GFP-Link vector. 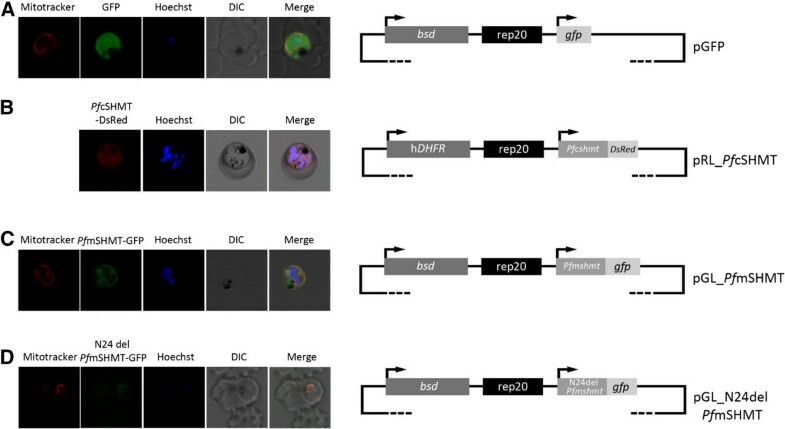 In order to determine the subcellular localization of Pf cSHMT in malaria parasite, gfp in pSSPF2/Pf Hsp60-GFP-Link was replaced with the gene encoding red fluorescent protein DsRed generating pSSPF2/Pf Hsp60-DsRed. Then, the coding sequence of Pfcshmt was PCR amplified from cDNA and inserted into pSSPF2/Pf Hsp60-DsRed replacing a mitochondrial targeting sequence of PfHsp60 at Bgl II and Kpn I sites. For construction of the vector to enable study of putative Pf mSHMT localization, human dhfr in pSSPF2/Pf Hsp60-GFP-Link was replaced with blasticidin S deaminase (bsd) at Bam HI and Hind III sites, after which the open reading frame region of putative Pfmshmt was inserted at Bgl II and Kpn I sites. DNA sequences of the two constructs, named pRL_Pf cSHMT and pGL_Pf mSHMT, were confirmed by DNA sequencing (1st BASE, Singapore). All animal experiments were performed according to the international and national guidelines for ethical conduct on the care and humane use of animals with approval of the Ethical Committee on Animal Experimentation, National Center for Genetic Engineering and Biotechnology (BIOTEC), Thailand. Mouse strain ICR was intraperitoneally infected with P. berghei (106 infected (i) RBC), and blood from tail vein was collected for determining parasitaemia. Transfection of plasmids into P. berghei was performed according to a previously described protocol. In brief, 5–10 μg of each construct were linearized by digestion with Sac II, and transfected into purified schizonts using Basic Parasite Nucleofector Kit 2 (Lonza AG, Cologne, Germany) and Amaxa Nucleofector™ device (Amaxa Biosystems GmbH, Cologne, Germany) according to pre-set U033 program. Transfected parasites then intravenously injected into mice tail vein and selected by providing the mice with 70 μg/ml PYR (Sigma-Aldrich, Missouri, USA) in drinking water. For localization studies, P. falciparum strain 3D7 was cultured in human RBC (5% haematocrit) in RPMI-1640 medium (Invitrogen™) supplemented with 0.3 g/l L-glutamine, 5 g/l hypoxanthine and 10% human serum under an atmosphere of 1% O2 and 5% CO2. Transient transfection of P. falciparum with plasmids was performed by electroporation as previously described. In short, 5-10% synchronous ring stage parasites were electroporated with 100 μg of plasmid using Gene Pulser Xcell Electroporation System (Bio-Rad Laboratories, California, USA) at 0.310 kV and 950 μF. pRL_Pf cSHMT and pGL_Pf mSHMT transfected parasites were cultured in the presence of 2 nM WR99210 and 2 μg/ml blasticidin S (Invitrogen™) respectively. Blood from transfected P. berghei-infected mice was collected by heart puncture. White blood cells were removed by passage through a syringe packed with Whatman® CF11 cellulose powder. gDNA was extracted from intra-erythrocytic transfected parasites using Genomic DNA Mini Kit (Geneaid Biotech, Taiwan), and was used in PCR and Southern blotting to assess integration of plasmid constructs at the desired loci. Diagnostic PCR to amplify endogenous Pbcshmt, 5′ integration fragment, and 3′ integration fragment was performed using primer pairs of Xho I Pbcshmt F and Bam HI Pbcshmt R, 5′UTR int Pbcshmt F and 5′UTR int Pbdhfr-ts R, and 3′intDS F and 3′UTR int Pbcshmt R, respectively. The protocols described above were conducted also with wild type parasites. The putative Pbmshmt was amplified as a control (using Xho I putative Pbmshmt F and Bam HI putative Pbmshmt R primers). For Southern blot hybridization, approximately 20 μg of gDNA extracted from transgenic and wild type parasites were digested with Eco RV and Bgl II. DNA fragments were separated by 1% agarose gel-electrophoresis and transferred to nylon membrane (Merck Milipore, Massachusetts, USA) for hybridization with digoxigenin-labelled 5′UTR and 3′UTR probes of Pbcshmt according to the manufacturer’s protocol (DIG High Prime DNA Labeling and Detection Kit II; Invitrogen™). Expression of Pbcshmt, putative Pbmshmt, Pvcshmt, and Pbα-tubulin-2 in wild type and transgenic P. berghei parasites were assessed by RT-PCR. Expression level of putative Pbmshmt was measured by quantitative RT-PCR (qRT-PCR) using CFX96™ Real-Time System and iQ™ SYBR® Green Supermix (Bio-Rad Laboratories) normalized to Pbα-tubulin-2 expression level Relative gene expression using 2-ΔΔCT formula. Total RNA and first strand cDNA were prepared for analysis by RT-PCR and qRT-PCR as described above. Three ICR mice per group were injected intravenously in the tail vein with either wild type or transgenic parasites (106 iRBC/mice). Parasite numbers were counted every day using Giemsa-stained blood smears (from tail vein) under a light microscope. Parasites were stained with Mitotracker™ (Roche, Basel, Switzerland) and Hoechst 33258 (Sigma-Aldrich) dyes according to manufacturer’s protocols. Localization of fluorescent protein-tagged SHMT isoforms in transfected parasites was determined using Zeiss LSM 700 laser scanning confocal microscope (Carl Zeiss Micro-Imaging GmbH, Germany) at excitation and emission wavelengths of 555 nm and 572 nm respectively for DsRed, and at 488 nm and 509 nm respectively for GFP. Images were processed using ZEN 2009 software. Although Pf cSHMT has been characterized in a number of reports[8, 9, 12, 13, 21], not much is known regarding the properties of putative Pf mSHMT, except for its mitochondrial location based on gene prediction and annotation in PlasmoDB. When the expression patterns of the two shmt forms were compared in P. falciparum during intra-erythrocytic developmental stages using semi-quantitative RT-PCR (normalized to that of Pfα-tubulin-2 expression), transcripts of both Pfshmt forms were detected throughout all erythrocytic stages, with peak transcript levels appearing during early and late trophozoite stage for putative Pfmshmt and Pfcshmt respectively (Figure1). These results are in agreement with the role of SHMT in dTMP biosynthesis required for DNA replication. Expression of Pfcshmt and Pfmshmt at different intra-erythrocytic developmental stages. Expressions levels of Pfcshmt and Pfmshmt transcripts were assessed by semi-quantitative RT-PCR of cDNAs prepared from sorbitol-synchronized P. falciparum 3D7 strain. Results are reported as relative values normalized to Pfα-tubulin-2 transcripts. 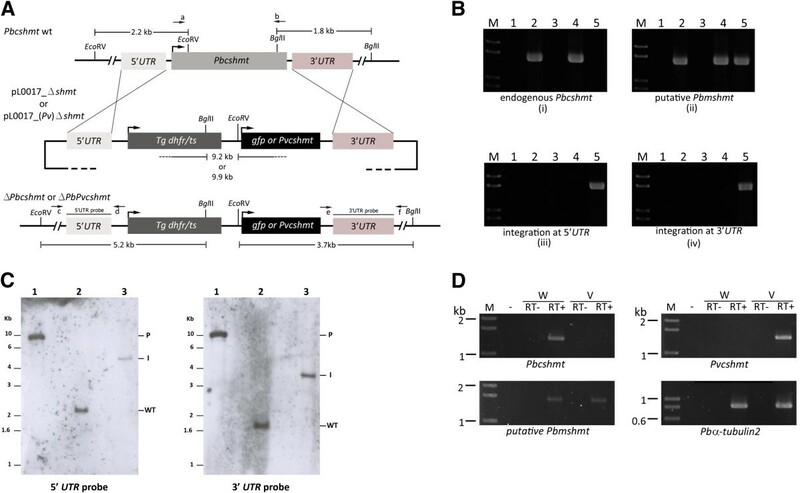 In order to identify the locations of the two Pf SHMT isoforms in the parasite, pRL_Pf cSHMT and pGL_Pf mSHMT plasmids were constructed to express Pf cSHMT fused with DsRed and Pf mSHMT fused with GFP in the parasites (Figures2B and2C). The expression of these fusion proteins is driven by the constitutive promoter, Pf Hsp86[17, 22, 23]. Transgenic parasites expressing GFP alone showed a diffuse distribution pattern of green fluorescence throughout the cytoplasm (Figure2A). The distribution of DsRed-tagged Pf cSHMT appears to be dominantly in cytoplasm (Figure2B). Pf cSHMT-DsRed fluorescence appears more variable in intensity compared to that of GFP alone in the cytoplasm. This may be partly explained by the superior fluorescence properties of GFP which is more intense and photostable compared to those of DsRed. The intensity of the fluorescence reporter protein may also be affected when fused with another protein. The distribution of GFP-tagged Pf mSHMT was co-localized with Mitotracker™ within the mitochondria (Figure2C). The micrograph also suggest less intense signal seen in the area conterminous with the food vacuole, which likely comes from auto-fluorescence of crystalline haemozoin. This phenomenon was also observed in non-transfected parasites, especially when the image brightness was enhanced. Localization of P. falciparum SHMT isoforms. Parasites were transfected with pGFP (A), pRL_Pf cSHMT (B), pGL_Pf mSHMT (C), and pGL_N24del Pf mSHMT (D) plasmids expressing fluorescent signals from GFP or DsRed. Schematic diagrams of the recombinant plasmids used are shown alongside the confocal micrographs. Mitochondrion and nucleus is stained with Mitotracker™ (red) and Hoechst 33258 (blue) dye respectively. DIC, differential interference contrast image; rep20, rep20 sequence; bsd, blasticidin S deaminase; hDHFR, human dihydrofolate reductase; gfp, green fluorescence protein; DsRed, red fluorescent protein. In most eukaryotes, a mitochondrial localization signal sequence is located at the N-terminus of proteins targeted to this organelle. However, this feature is not well-characterized in Plasmodium. PlasMit program is the only available tool to predict Plasmodium mitochondrial-targeted proteins based on previously characterized malaria parasite mitochondrial proteins, which analyzed the first 24 N-terminal amino acids of Pf mSHMT and predicted it to be a mitochondrial protein. Plasmid pGL_N24del Pf mSHMT, expressing GFP-tagged Pf mSHMT with deletion of the first 24 N-terminal amino acids (N-24 truncated Pf mSHMT-GFP), was constructed to test the validity of this sequence as mitochondrial targeting signal. Confocal microscopy showed co-localization of N-24 truncated-Pf mSHMT-GFP with Mitotracker™ (Figure2D), indicating that this 24 N-terminal amino acid sequence does not play a role as a mitochondria targeting signal. Recently, Read et al. reported that the first 100 N-terminal amino acids of Pf mSHMT targets GFP-fusion protein to the mitochondrion. In order to identify the minimal mitochondrion-targeting sequence, plasmids were constructed to express GFP fusion proteins containing a series of truncations of the N-terminal 120 amino acids (Figure3). All sequence-tagged-GFP were found only in the cytoplasm, except N1-80-GFP that was present in both mitochondrion and cytoplasm. Along with these results, in a separate experiment, the truncated del-N1-80-Pf mSHMT-GFP was found in cytoplasm. The data suggest that the mitochondrial signal sequence is likely to involve longer span of Pf mSHMT N-terminal amino acids than previously predicted. Mitochondrial signal peptide mapping of Pf mSHMT. Schematic diagrams depict localization of GFP fusion protein with (i) full-length Pf mSHMT, (ii) N-terminus truncated Pf mSHMT, and (iii) a series of truncated N-terminal 1–120 amino acid fragment of Pf mSHMT. N24del and N80del refer to deletion of N-terminal amino acids at positions 1–24 and 1–80 of Pf mSHMT respectively. The numbers in N1-80, N1-40, N21-60, N41-8 0, N61-100 and N81-120 refer to amino acid positions at N-terminus of Pf mSHMT. The role of Plasmodium cSHMT was assessed using P. berghei transfection system because genetic manipulations of P. berghei are more efficient than that of P. falciparum. Two transfection plasmids were constructed, which upon double crossing-over recombination event from transfecting with linearized plasmids, resulted in replacement of Pbcshmt with the coding sequence either Pvcshmt or gfp (Figure4A). Following selection of transfected P. berghei with PYR, only transgenic parasites containing Pvcshmt in place of Pbcshmt were recovered (ΔPbPvcshmt). These results were consistent in three independent experiments. DNA analysis of transgenic parasite clones (obtained by limiting dilution) was undertaken to confirm the presence of the transgene, Pvcshmt. PCR amplification using specific primers for the recombination events in transgenic parasites showed a set of unique bands indicative of the integration of Pvcshmt (Figure4B). Southern blot analysis indicated an absence of endogenous Pbcshmt in Pvcshmt replacement clones (Figure4C). In addition, RT-PCR confirmed the absence of Pbcshmt expression, but that of Pvcshmt transcript instead (Figure4D). These results rule out the recombination refractory property of the Pbcshmt locus and lend support to the indispensability of shmt for malaria parasite growth and development. Targeted deletion of Pbcshmt . (A) Schematic diagram depicting the genomic organization of Pbcshmt locus following disruption or allelic replacement with Pvshmt coding sequence. Enzyme restriction sites, along with fragment sizes and their specific probes are indicated. (B) PCR diagram of molecular characterization of transfected parasites. Lanes 1–5: (1) water control; (2) gDNA of P. berghei wild type; (3) pL0017_(Pv)Δshmt; (4) and (5) gDNA of P. berghei transfected with pL0017_Δshmt and pL0017_(Pv)Δshmt, respectively. Primer pairs a & b, c & d, and e & f (sequences reported in Additional file1) are used to amplify (i) endogenous Pbcshmt, (iii) 5′ integrated fragment, and (iv) 3′ integrated fragment, respectively. Amplification of putative Pbmshmt (ii) was performed as a control. (C) Southern blot hybridized with 5′ or 3′UTR probe to confirm Pvcshmt allelic replacement at Pbcshmt locus. DNA was digested with Eco RV and Bgl II. Lanes are: (1) pL0017_(Pv)Δshmt plasmid, (2) gDNA of P. berghei wild type, and (3) gDNA of transgenic ΔPbPvcshmt P. berghei, respectively. P, I, and WT indicate expected band size for pL0017_(Pv)Δshmt plasmid, integrated Pvcshmt, and endogenous Pbcshmt, respectively. (D) RT-PCR diagram for detection of shmt transcript. Lanes are: (M) 1kb ladder, (−) water control, (RT-) no RT control, (RT+) cDNA, (W) P. berghei wild type, and (V) transgenic P. berghei harbouring Pvcshmt. Pbmshmt and Pbα-tubulin-2 were amplified as control genes. In order to examine if the presence of Pvcshmt in transgenic P. berghei is functionally equivalent to that of endogenous Pbcshmt, growth profiles of these parasites were compared. Morphology of transgenic ΔPbPvcshmt parasites at different sampling times did not appear to be affected (Figure5A). However, the parasitaemia of transgenic ΔPbPvcshmt parasites appeared to be less than that of the wild type (Figure5B). Morphology and parasite count. Morphology (A) and parasite count (B) of wild type and ΔPbPvcshmt (allelic replacement with Pvshmt coding sequence) transgenic P. berghei. Thin blood smear and parasitaemia determination were performed every day post infection for 9 days. A redundant role for the two SHMT isoforms has been demonstrated in eukaryotes. On the other hand, attempts in this study to knock out cshmt from both P. falciparum and P. berghei, and leaving mshmt intact, were unsuccessful. Expression profiles of mshmt in wild type and transgenic ΔPbPvcshmt parasites were comparable. Thus, it does not appear that there is a redundancy role between plasmodial c- and mSHMT. SHMT links together several metabolic pathways, including biosynthesis of folate, dTMP, and methionine. The biological necessity of this enzyme in malaria parasites has been proposed as shmt transcripts are markedly increased during the rapid intra-erythrocytic stage progression. Similar to other eukaryotes, Plasmodium spp. has two SHMT isoforms, a functioning cshmt and a putative mshmt allele. It is worth noting that, unlike other eukaryotes where c- and m-SHMT isozymes are highly conserved, Pf cSHMT and Pf mSHMT share only ~20% similarity with each other. Here, results show that Pfmshmt is a functional gene by demonstrating the expression of gene product throughout the asexual stage development. The presence of two isoforms in Plasmodium spp. raises the possibility of a redundant role and a potential overlap in their functional activity. For instance, in mice, examination of nuclear extracts of cshmt- knockout mice showed 25% SHMT activity compared to wild type mice; the remaining SHMT activity is due to the presence of mSHMT in the nuclear extract, suggesting a redundant function of the two murine SHMT isoforms. In the case of Plasmodium spp., null-mutants of cshmt-knockout parasite clones could not be recovered from transfected P. falciparum, even though methionine, folinic acid, or a mixture of these compounds was supplemented at concentrations 10-fold higher than that present in RPMI. However, in P. berghei, cshmt-knockout parasite clones could only be recovered when complemented with cshmt from another Plasmodium species (in this case P. vivax). These results provide experimental confirmation of the essentiality of cshmt in the survival of malaria parasites. 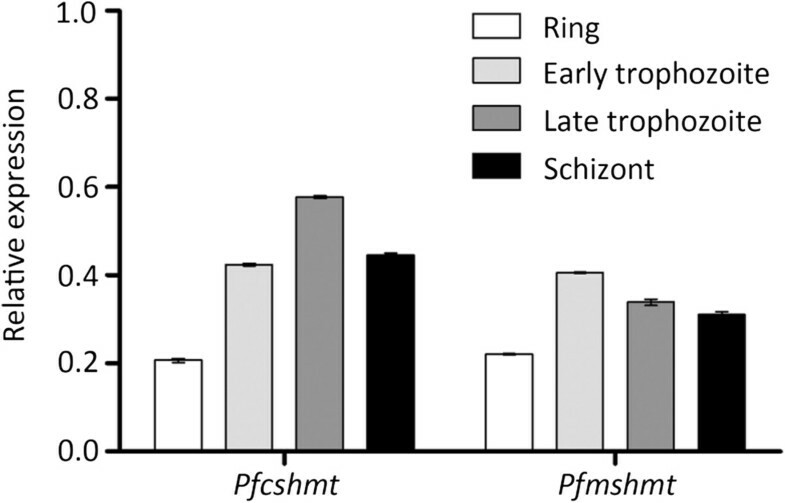 In addition, these results suggest that there is functional conservation of cSHMT among Plasmodium spp., but not between cSHMT and mSHMT of the same species. On-going efforts to express recombinant mSHMT are in progress in order to confirm its role in malaria parasites. 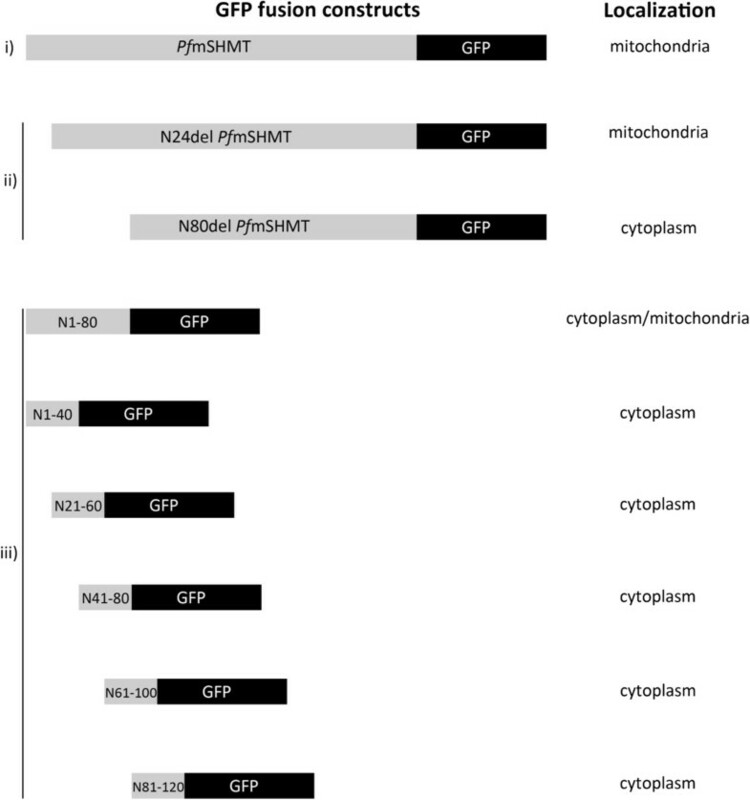 The first 24 N-terminal amino acids of putative plasmodial mSHMT contain several basic amino acids characteristics of mitochondrial targeting sequence[26, 31]. Previous study observed that the first 100 N-terminus of Pf mSHMT is sufficient for mitochondria targeting. In this study, transfection system using GFP reporter gene was taken to examine the cellular localization of Pf mSHMT and to identify the minimum sequence required for mitochondrial targeting of this enzyme. Contrary to the previous prediction, the removal of putative mitochondria signal sequence (N-terminus amino acids 1–24) of Pf mSHMT did not affect its localization to the mitochondria, suggesting that that the targeting sequence may be downstream of the putative mitochondria targeting sequence. Systematic deletions of the first 120 amino acids of Pf mSHMT demonstrated that the minimum leader sequence for mitochondrial targeting lies between amino acids 25–80. However, detection of cytoplasmic/mitochondria fluorescence of N1-80-GFP suggests that a more complex mechanism may be involved, such that a longer signal sequence may provide more specific localization to the mitochondria. Intracellular localizations of Pf cSHMT and Pf mSHMT were addressed in this study by direct observation of SHMTs fusion with reporter protein compared to previously published work using immunofluorescence approach (IFA). The IFA with polyclonal antibody suggested a stage dependent localization pattern where Pf cSHMT appeared in the cytoplasm, and also to apicoplast in the mid/late trophozoite to schizont stage. Pf mSHMT appeared mainly in the mitochondria with some distribution in the cytoplasm. Multi-organelle localizations observed in these IFA experiments may be in part due to cross-reaction of polyclonal antibodies. Whilst the current work relies upon the intrinsic fluorescence from GFP or DsRed fused to SHMT of interest, with the assumption that the fusion proteins behave the same as native SHMTs. Despite different approaches, these studies are complementary of each other, as both studies revealed distinct compartment localization of Pf cSHMT and Pf mSHMT. Various phenotypic consequences in shmt-deficient cells have been described. Inactivation of shmt results in glycine auxotroph phenotype in some organisms, such as Escherichia coli, while shmt mutations in Caenorhabditis elegans lead to maternal-effect lethal phenotype, pointing to the essential role of SHMT. In this study, attempts were made to generate Pbcshmt null mutant but the gene could not be replaced by a knockout construct. The refractoriness of Pbcshmt locus was ruled out as our attempts to replace the endogenous gene with Pvcshmt were successful. Additionally, the redundancy role of SHMTs in malaria parasite can be excluded. Transgenic P. berghei parasites containing Pvcshmt were able to infect murine red blood cells and complete their blood stage life cycle, albeit at a lower parasitaemia when compared with that of the wild type parasites. This implies that replacement of shmt affects fitness of transgenic parasite, which may be due to differences in catalytic efficiency between rodent and human plasmodial enzymes. This could readily be proven by comparing kinetic parameters of recombinant Pb cSHMT and Pv cSHMT. It should also be noted that the expression of Pv cSHMT was regulated by Pb eef1α promoter, which might have an effect on the growth of mutant parasite. Plasmodium SHMT has been suggested to be the rate-limiting enzyme in dTMP synthesis pathway, and thus is a potential target for drug development. Various classes of compounds, including 2,4-diaminopyrimidine, have been proposed to be effective inhibitors of Plasmodium SHMT based on binding affinity obtained from molecular docking calculations[34, 35]. The recent study has shown that a number of 2,4-diaminopyrimidine compounds can inhibit Plasmodium SHMT. Further optimization employing a target-based design approach should allow design of more effective anti-malarial drugs targeting Plasmodium SHMT. Both isoforms of plasmodial SHMT are highly expressed during the trophozoite stage, which highlight the role of these enzymes during parasite growth and development. Fluorescent-tagged plasmodial SHMT proteins confirmed the expected sub-cellular location of cytoplasmic and mitochondrial SHMT. The indispensable role of Plasmodium cSHMT for intra-erythrocytic development was inferred from the inability to generate cshmt knock-out parasites, which also indicated that the two SHMT isoforms do not possess redundant function typical of other eukaryotes. Therefore, cSHMT is a validated anti-malarial drug target. Furthermore, transgenic P. berghei containing human malaria cshmt in place of endogenous gene will serve as an in vivo model for evaluation of novel anti-malarials directed against human plasmodial SHMT. The study was financial supported by Cluster Program and Management Office for Discovery based Development, National Science and Technology development Agency, Thailand (CPMO-DD/P-10-11274). We thank Prof. Prapon Wilairat for editing the manuscript. We acknowledge Carl Ziess Thailand for use of Zeiss LSM 700 laser scanning confocal microscope.